Experience a world of difference from Singapore hustle and bustle, but with the convenience of being just 10 mins drive to Changi International Airport, Suntec City, Singapore Expo and Orchard. With 540 guest rooms and suites featuring the best in contemporary Asian design. 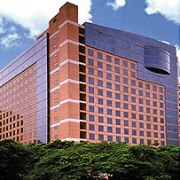 The Grand Mercure Roxy Hotel is on the east coast of Singapore, on Marine Pde Rd just across the street from Parkway Pde Shopping Centre. East Coast Park with its beach, eateries and recreational facilities is a short walk away.